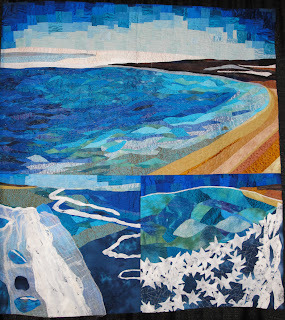 The Long Beach Quilts Festival is just a short walk from my house, so I went to the show on Friday to look at the quilts and get my shop on. 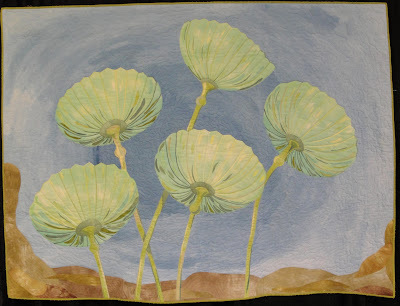 Lots of great vendors with plenty for everyone and gorgeous, amazing quilts. Here are some of my favorites. To see the quilt in greater detail, click on the image to view it bigger on your screen. The page may load slowly because the pictures files are big. Each quilt had a short blurb explaining the inspiration or story behind the quilt, which was always just as fascinating as the quilt itself. "Spellbound" by Lynda Claus. 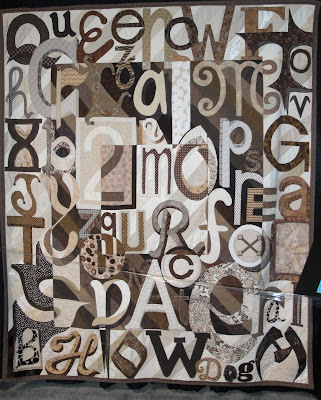 I love the variety of textures in this quilt. 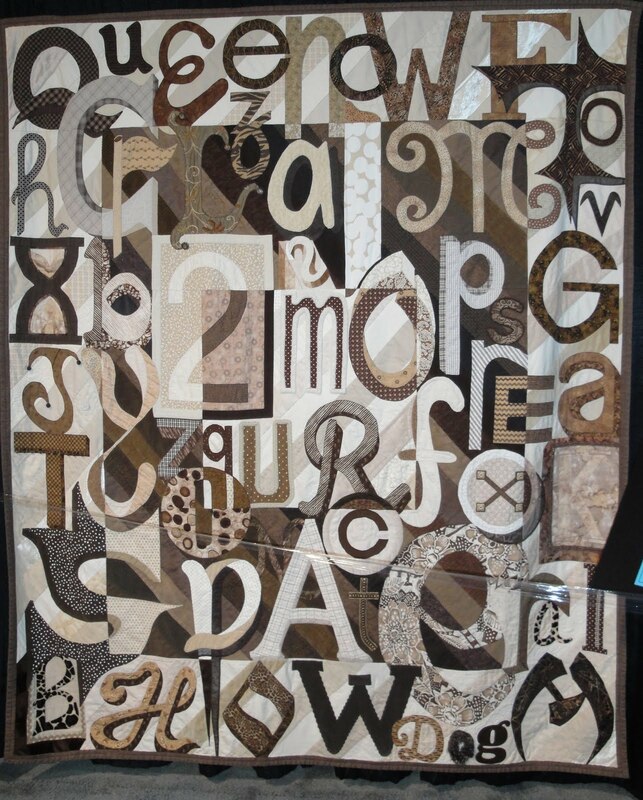 Design inspiration: My client's fascination for fonts and my stash of brown fabrics. "Skating" by Joyce E. Seagram, Quilted by Edna Koepke. The colors caught my eye as did the quilting lines. Design source: An important ingredient of the Canadian culture is skating in the winter, whether on a frozen lake, a farmer's pond, or a formal rink with artificial ice. The myriad swirls and scrawls on the ice left by skaters are part of most Canadians' visual images of growing up. The technique I learned from Nancy Crow, the working with blue or red against black, red or white against blue, and the other combinations, provided a fascinating resource by which I could recreate the patterns I remember from my skating at the local park. "The Dead Sea" by Eti David. 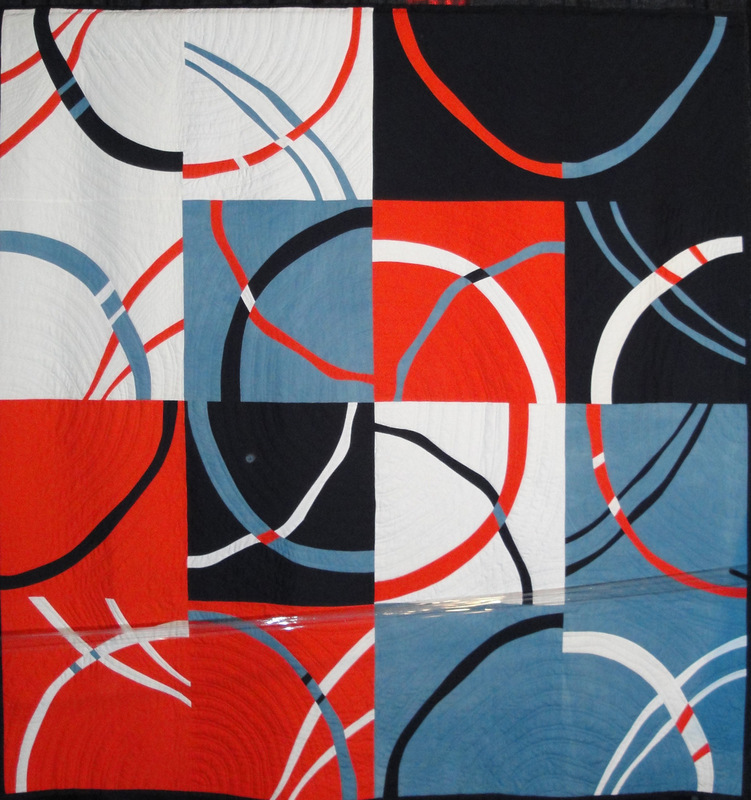 This quilt is so vibrant with all the shimmering blues and bright whites. 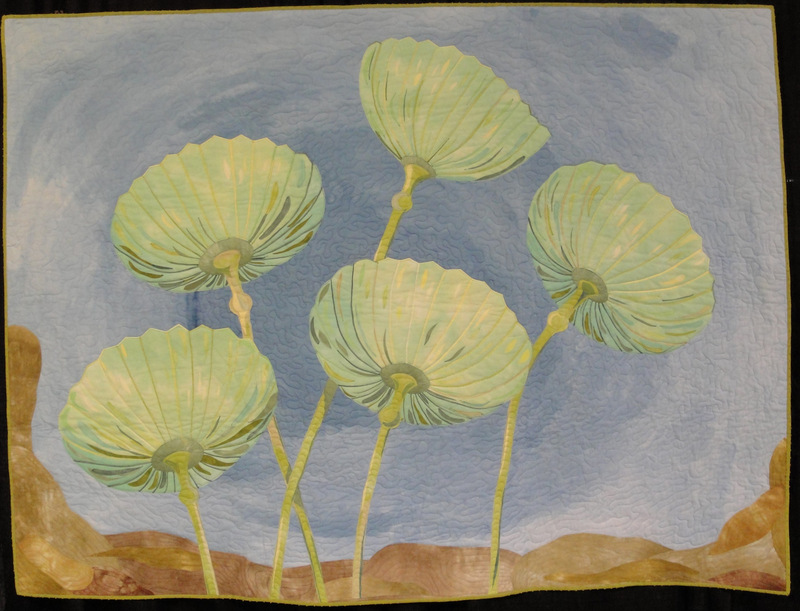 The quilting is incredible, too, and adds wonderful texture to the quilt. Design source: The Dead Sea itself. The Dead Sea was one of the objects that were nominated to "The Wonders of the World" last year. It was not chosen, but I think it should have been. It is unique. It's the lowest point on earth and it's beautiful. "Mermaids Wineglasses 2" by Sara McClean. MB, this one is for you. These tiny fragile-looking plants are a wonder of the world. They only stand 2 inches high. They grow in shallow rock pools in the Bahamas. They are most commonly called Mermaid Wineglasses - a beautiful name! I imagined these tiny plants as towering giants and what it would be like to stand under them looking up. It would make me the size of a grain of sand. It's amazing when you consider that these delicate stems withstand the constant pounding of the ocean and the cups are never crushed by the waves or tides - only when human hands try to pick them. They highlight how wonderful the natural world is around us. Often it is the tiniest things that truly are wonders of the world.